Architecturally: Considered with Frognall, both as fully developed examples of the Italianate style, Parlington is among the best of its style and scale group : both being distinguished by the high integrity, application of ornate cement detailing and the dynamic composition employed in both buildings as aided by their towers and overall three-dimensional treatment: of State importance. The building also has significance for its intact unpainted rendered facade and intact interior with its elegant staircase, splendid stained and frosted glass, the servants' bells throughout and original gas fittings in the hall and front room also the intact stable and coach house block with its original timber stalls and feed-boxes. The curved carriage drive with its ovaloid lawn design as shown on a 1905MMBWdrainage plan still remains, providing part of the original setting. Historically: Parlington, with its distinctive tower illustrates well the lifestyle of the affluent merchants and businessmen who flocked to the suburbs of Camberwell, Canterbury, Surrey Hills and Glen Iris during the boom years of the 1880s following the extension of the railway system. 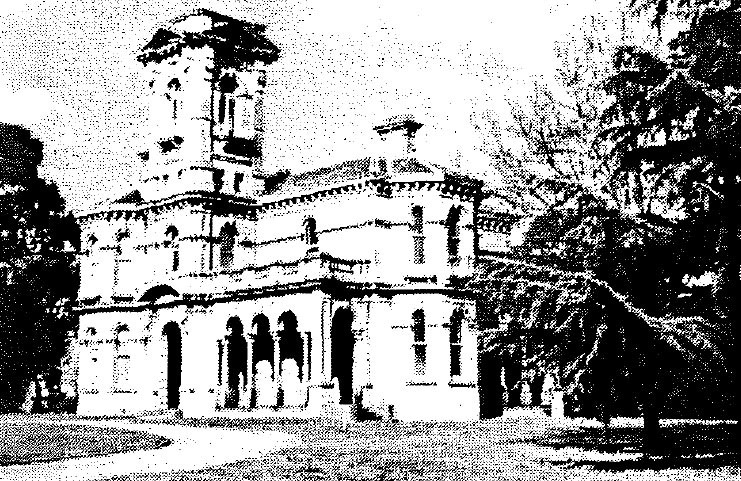 Parlington's site has associations with 19th century railway development through its occupancy by William Elsdon, Chief Engineer of the pioneer Melbourne and Hobson's Bay Railway Company in the 1850s and then of the site in the 1870s prior to the extension of the railway to the Camberwell area. The house has associations from the 1890s until the turn of the century with the pioneer Australian brewer, Albert Terry, who died at Verulam (the earlier name for Parlington) in August 1907: of State importance. Distinguishable As A Pre-Subdivision House, In A Largely Edwardian Context And, Importantly, identifiable as the near twin of Frognall, each visible from the other's tower. The house is both externally and internally in a remarkably intact condition.
. The Italianate house with its asymmetrical composition decorated by loggias and a tower still has an unpainted rendered facade. The interior is equally intact with its splendid stained glass over the front door with the cat motif bearing the motto 'Touch not the cat bot a glove,' stained glass panels in the hall doors depicting spring and summer and above the elegant staircase panels with bird motifs. It is believed that encaustic mosaic tiles survive under the front hall carpet. Memories of a more affluent life style are suggested by the servants' buttons throughout the house beside the marble fireplaces and the original elaborate gas fittings in the hall and front room. When the Kellett family moved in during the 1950s, there was electricity only in one room. Like Frognall, the house uses the Italian Renaissance villa revival as a vehicle to impress, both in the grandeur of its massing and the detail of its ornament. As with Frognall, both arcuation and trabeation are applied to the house elevations, each providing the required void or mass to aid the dynamic nature of the composition. Both covered and open terraces are utilized towards the same aim but it is the tower, with its massive pediments and balustraded parapet, which provides the most distinctive element in the composition. The stilted arch and segment arch forms also play a role in breaking up the massive wall planes created by the building's scale. Deep eaves brackets, an ornate impost mould, keystones and bracketed sills are few of the standard architectural devices used in contemporary Italianate style villas. Swags, elongated modillions and barreled chimney tops add to the mounting detail. An exceptional feature of the house is the intact stable block at the rear which comprises the original stables, coachhouse and coachmen's quarters shown in the 1905 MMBW plan. The stables still contain the original timber stalls and feed bins. There is also a cellar under the house with a wired-in pantry/creamery area. Some work has been done on the stables in more recent times. Although the extensive garden/orchard area has gone, the curved carriage drive with its ovaloid lawn design shown in the 1905 plan still remains.